The Normandy landings (codenamed Operation Neptune) were the landings on Tuesday 6 June 1944 in World War II. Invasion forces landed at Gold Beach, Sword Beach, Omaha Beach Juno Beach, Pointe du Hoc and Utah Beach. The landing started on the so-called D-Day. It was by the Allies of World War II: the U.S.A., British, Canadian, Australian and other forces. The whole event was codenamed "Operation Overlord" and intended to open a new Western Front of the war. It was the largest seaborne invasion in history. After landing, the Allied forces failed to take any of the towns and places they had planned to take. However, they were able to control the beaches, and in the following days they moved inland. German casualties on D-Day have been estimated at 4,000 to 9,000 men. Allied casualties were at least 10,000, with 4,414 confirmed dead. 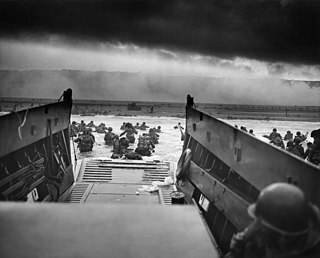 The Normandy landings were the largest and deadliest amphibious assault in the history of warfare. This page was last changed on 28 November 2018, at 07:57.